Within the last couple of months I have posted a bit about Yin Yoga. My first post, Yin Yoga, briefly explains that Qi can be blocked from flowing freely through the body. Yin Yoga, with its long holds and the stretching of the fascia and other connective tissue can help open the meridians freeing up the Qi. I’ve also posted two separate post about the Jing Well Points, one for the Jing Well Points Of The Feet and one for the Jing Well Points Of The Hands. I also did two separate post on the Leg Meridians, there are Yin Leg Meridians and Yang Leg Meridians. This goes for the arm Meridians, too, there are Yin ones and Yang ones. I also did a post on the Six Levels Or Divisions of Qi, giving a broad explanation of how weakness, pain, or the inability to do certain movements is connected with specific levels of Qi. My first post about the levels of Qi talked about the organ relationships. In this post I will revisit the organs and meridians just to quickly clarify the leg meridians and the arm meridians to the corresponding level of Qi. There are six levels of Qi. Three are yang and three are yin. Each level has a leg sinew meridian and an arm sinew meridian associated with it. 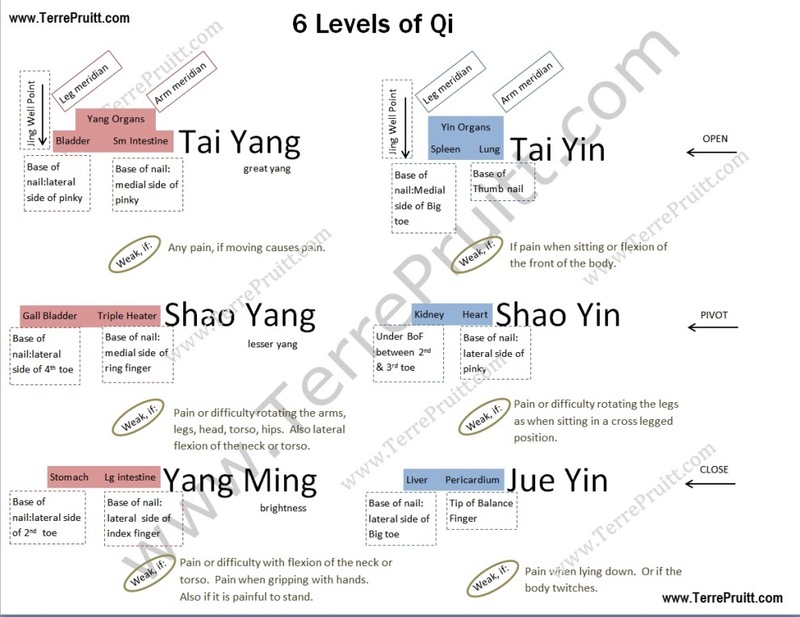 The six levels are: Tai Yang, Shao Yang, Yang Ming, Tai Yin, Shao Yin, and Jue Yin. Tai Yang – The yang organs associated are the bladder and the small intestine. The bladder sinew meridian is a yang leg sinew meridian. The small intestine sinew meridian is a yang arm sinew meridian. Shao Yang – The yang organs associated are the gall bladder and triple heater. The gall bladder sinew meridian is a yang leg sinew meridian. The triple heater sinew meridian is a yang arm sinew meridian. Yang Ming – The organs associated are the stomach and large intestine. The stomach sinew meridian is a yang leg sinew meridian. The large intestine sinew meridian is a yang arm sinew meridian. Tai Yin – The yin organs associated are the spleen and lungs. The spleen sinew meridian is a yin leg sinew meridian. The lungs sinew meridian are yin arm sinew meridian. Shao Yin – The yin organs associated are the kidneys and the heart. The kidneys sinew meridian is a yin leg sinew meridian. The heart sinew meridian is a yin arm sinew meridian. Jue Yin – The yin organs associated are the liver and pericardium. The liver sinew meridian is a yin leg sinew meridian. The pericardium sinew meridian is a yin arm sinew meridian. This information can play a role in designing Yin Yoga routines. It can help in guiding movement. As a Yin Yoga Teacher we are not diagnosing specific health issues, but we can witness movement issues and instruct accordingly. Also, it can be used a very general guide on which sinew meridians to concentrate on first. A morning Yin practice could have you going from Jue Yin to Yang Ming, whereas an evening Yin practice might go from Tai Yang to Jue Yin. Morning goes from less active Qi to the most active and a night the reverse. So it is interesting to have this information so that there is an idea of Qi is being moved and what it is associated with. Do you agree?